Parkland's Legacy: New Gun Laws, More Shooter Drills - Joe.My.God. State legislatures, both Republican- and Democratic-controlled, passed 76 gun control laws in the past year — from bans on bump stocks and caps on magazine sizes to new minimum-age requirements and expanded background checks. Among the victories for gun control advocates was an omnibus bill in Florida that raised the minimum age to purchase a firearm in the state to 21 and extended the waiting period to three days. In all, more than half the states passed at least one gun control measure in 2018, with Washington and New York joining the trend in 2019. Some students around the country marked the anniversary of the school massacre in Parkland, Florida, with moments of silence Thursday or somber vigils while others sought to find threads of positivity in the fabric of tragedy. Boardman High School in northeast Ohio planned to have a “legacy lockdown” including an active-shooter drill, a chime ringing once for each of the 17 victims from Parkland’s Marjory Stoneman Douglas High School, and an opportunity to applaud local emergency responders. It repeats an event they did weeks after the Florida shooting: Students practiced hiding during the drill, then lined the hallways to clap and cheer as dozens of police and other responders walk through the school. In the aftermath of the shooting, a lot was promised and little, ultimately, was done. In fact, one of the main things to be done had nothing to do with access to guns or assault weapons. Instead, it had to do with what happens in our schools: active shooter drills became much more prevalent across the US, and I have seen firsthand the effect that this has on our children. These new drills are far more intense than your standard lockdown drills. During active shooter drills, students and staff rehearse various instructed responses — maybe throwing things at the “shooter,” maybe escaping, maybe hiding. Some of these drills even involve officers shooting blanks from real guns. Little is known about the emotional impacts of active shooter drills on children, but we have plenty of anecdotal evidence that many children are terrified during them. Once a month, students at Marjory Stoneman Douglas high school (MSD) in Parkland, Florida must relive the most frightening day of their lives. A “code red” drill is called over the intercom. Teachers stop teaching immediately, check that their classroom doors are locked, shut off the lights and cover their classroom windows. Students are directed to remain silent and huddle in a designated “hard corner” – an area of the classroom that has been deemed safe because it would be out of the line of site of a shooter in the hallway. In recent weeks, red icons have been painted onto classrooms walls at MSD to indicate a hard corner. The hard corners also feature special “bleeding control kits” affixed to the walls containing materials to stop the blood flow from gunshot wounds. Miami-Dade County police began a special training course for all of its officers Monday on how to handle a mass casualty incident, using lessons from the Parkland school shooting. “We’ve learned that, in some cases, one solo officer may need to go in there to resolve the incident or stop that attacker,” said Sgt. Manny Malgor with the Miami-Dade County Police Department. In the wake of unspeakable horror, the young people of Parkland rose up to demand action on gun violence and mobilized a generation of activists. 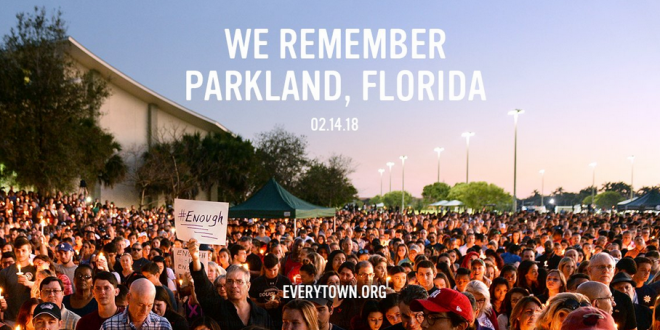 One year ago today, fourteen students and three staff members were shot and killed and seventeen more were injured in a horrific mass shooting at Marjory Stoneman Douglas High School in Parkland, Florida. One year ago, the #Parkland community lost 17 lives in a heinous act of gun violence. #SinceParkland 1,200 kids in America have been killed by guns. It’s long past time we unite in common purpose and pass common sense gun safety legislation to prevent more tragedy. A year after the Parkland Shooting, Congress still hasn’t passed strong legislation to address gun violence. But I’m going to keep fighting – along with the MSD survivors and students across the country who are working to #EndGunViolence. One year ago today, a gunman entered Marjory Stoneman Douglas High School in Parkland, FL, and killed 17 students and staff members, and injured 17 more. Please remember the people we’re stolen from us that day; they are why we fight for peace.